If you are creative, bright, and smart, you probably have A LOT of ideas of things that you COULD do! And maybe you even have the written down on sticky notes or even in a notebook somewheres. Or you spend time in the shower, figuring out new business concepts and plans in your head. 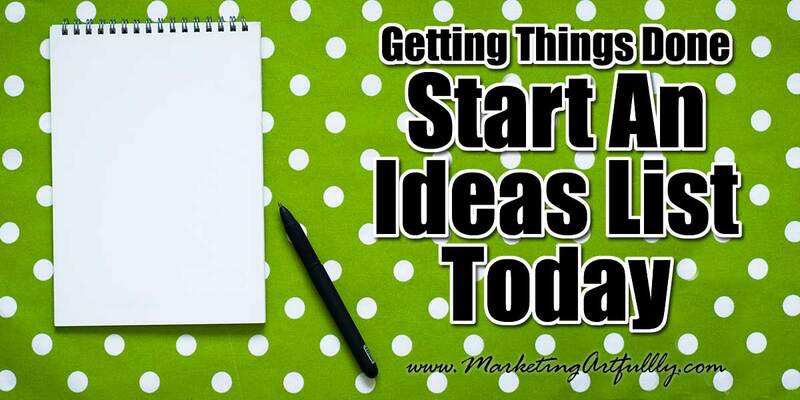 Or you love to brainstorm new ideas with mastermind partners or marketing friends. Wait a minute…that isn’t you, that’s me! or at least I did before I made myself the most brilliant piece of paper in the world, drumroll please, an IDEA SHEET! Right about now you are probably thinking, what the hell? All this buildup for a piece of paper? Well yes! But wait there IS more to it than that. First off, I have to tell you how I got to this glorious place. I have always known I am a “little scattered”, that I am a true entrepreneur that lives for the chase more than for the slog, but in spite of myself, I have been very successful over time. I have wonderful clients who I do have systems for and then I hired a coach and he was very sincere about letting me know I should focus on one group of my customers, the Realtors. Okay, I spent a lot of money to hire this guy, maybe I should listen. So I started doing Realtor stuff, wrote another book, made some courses and slowly, over time, ground my business to a halt. I could … not … make … one … more … Realtor … thing EVER. Okay that isn’t true, I have had some ideas since for my Realtor peeps since, but working in such a small box for all time would not work for me. Then I read the most amazing book, Getting Things Done by David Allen. I had heard about it before, but never thought anything of it until a friend suggested I read it. While his hundreds of folders would never work for me, I did ADORE his idea of getting everything out of my head onto pieces of paper. Functionally he suggests that you take EVERYTHING you are thinking about and start by putting each thought, task or to do on a separate blank sheet of paper. Then you group them by type of things and make lists of them. BRILLIANT! I did this and really started to find that I had something that I could work with. I thought that you would like to know how I organize my ideas in case you are considering trying this system for capturing your thoughts. In the front of my notebook I have just a generic ideas list. This is where my random ideas that don’t match anything else go. Some things on there right now are better autoresponders, top tab dividers and left handed planners. These are just random ideas I have had that might turn into something someday, but I don’t want to lose them now. Forms are my passion. Seriously, stop laughing! I love making worksheets and forms. I have always been able to break down tasks into systems and never knew that was a skill until I noticed that everyone else couldn’t do it! I have now started making forms for sale and so I ask everyone I meet what kind of forms they would like to have. I have hundreds of ideas in my forms tab of my binder. You may have something specific like this that is a core aspect of your business. Have a special ideas tab for just that part of it! Marketing Artfully and Paperly People. I have two separate parts of my business, my client and marketing work which is Marketing Artfully and my digital products and Etsy store division which is Paperly People. I have blog post, new products and general ideas lists separate for each division. Mr. Allen had a great explanation for why we shouldn’t have all our stuff jumbled together. If I had both divisions’ blog post ideas on one sheet I would have to use up brain cycles to think about which are for which site and to worry about what I am not doing rather than focusing on what I am accomplishing. I feel like, being a multi-passion entrepreneur, I will always have different “divisions” to my work and I really like that their ideas can be segregated this way. It make it easy to time block for each of them and really get things done rather than trying to “multi-task” which is impossible for me. One last REALLY neat ideas sheet that keeps coming up when I talk with my peeps is a 15 minute ideas sheet. It seems that my tribe like to get things done instead of jumping on Facebook when they have odd pockets of time. At least a couple of them are making a 15 minutes ideas list that they can knock out when they have a little bit of time, but not enough to accomplish a project. I REALLY like this idea, but it isn’t for me so I am just passing it along. Mostly my ideas are just that, ideas! They are awesome and glorious and not at all practical or relevant to my business, but because I wrote them down, they are out of my head and I can stop obsessing about them. I use my own Ideas Form that has check boxes to the left for making notations (you can use a piece of paper and just draw your checkboxes in if you like). The way I manage this is by having a legend for what stage my idea is in. Blank square for nothing has been done yet, have colored for started, and filled in for finished. 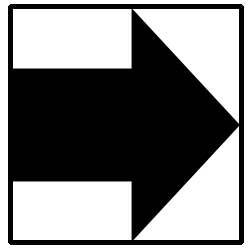 The last little note I sometimes make is an arrow to show that it has been moved somewhere else (either to another Idea Sheet or a Big Ideas Sheet). If my little system for catching ideas has helped you, please let me know! I love hearing about how entrepreneurs are able to harness the power of their amazing and use it for good rather than evil! Want More? 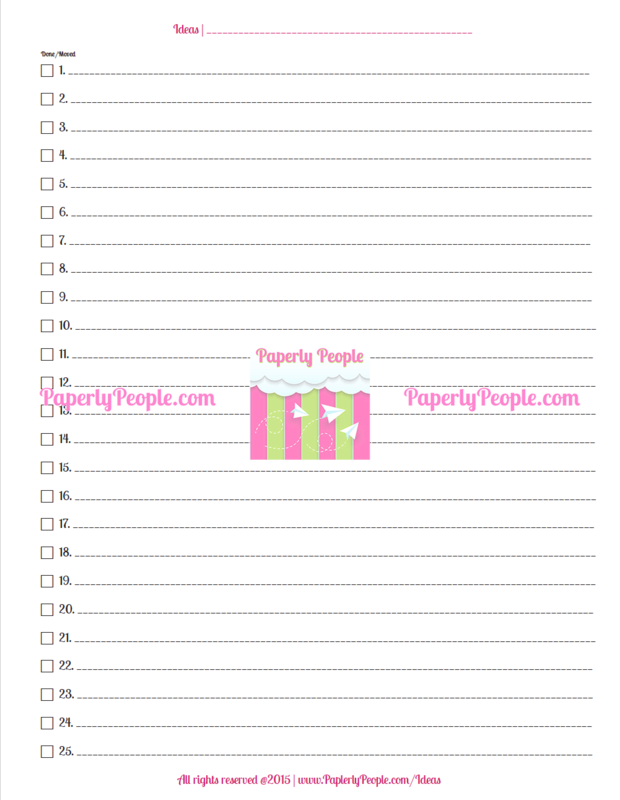 >> The Next Step In Organizing Your Ideas Is A BIG IDEAS Sheet!